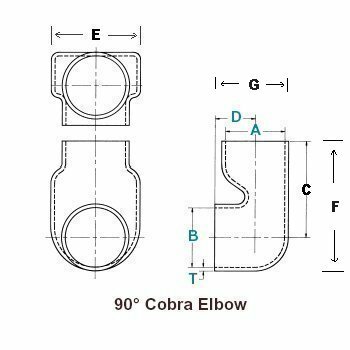 Cobra head elbows are used when clearance is extremely limited, such as when an air cleaner outlet is up against a firewall. There is no other way to make a really tight bend without losing air flow. How does the cobra head make such a tight bend without increasing turbulence? Because it flares out (see pictures), creating more volume internally without increasing height. Use a cobra head anywhere a standard or short-radius elbow will not fit. Temp rated at 250-275F. Made in USA.